Please return to the Emory News Center throughout the week for additional, in-depth coverage of Commencement, including video, photos, interviews, infographics and more. 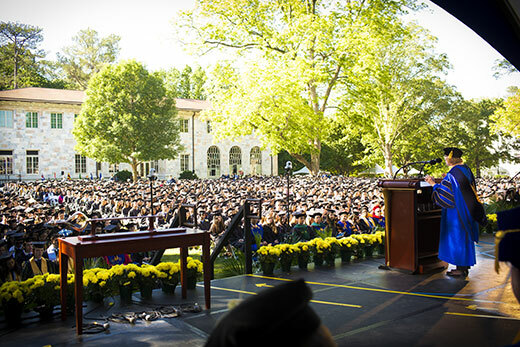 The Class of 2018 was celebrated Monday, May 14, at Emory’s 173rd Commencement, which featured a keynote address by Emory alumnus Michael Dubin, trailblazing entrepreneur and co-founder and CEO of Dollar Shave Club. As the sun rose, a crowd of about 15,000 guests began assembling on the Emory Quadrangle for the morning ceremony, which began at 9 a.m. with a grand academic procession led by a pipe and drum band, with students marching in from all four corners of the Quadrangle, and concluded with the collective conferral of degrees. The exercises were steeped in time-honored ritual and pageantry, including an array of colorful academic regalia, formal remarks by President Claire E. Sterk, a keynote address by Dubin, and the presentation of honorary degrees and awards. While no one knows exactly what lies ahead, "I am convinced that you — the Emory class of 2018 — will get it right," Sterk told graduates. "Because you get it. "You get Emory. You embrace our values: compassion, collaboration, integrity, inclusion, optimism and boldness," she said. "Use these as your compass." "Have confidence in yourself — and please have confidence in the world," Sterk continued. "Use your critical reasoning skills, ask questions, evaluate evidence, engage in interesting and difficult conversations. Stay open to new experiences. Take risks." The Class of 2018 includes 4,857 graduates from across the nine schools that make up Emory University. A total of 4,949 degrees — including 92 joint degrees — will be conferred upon students from 52 U.S. states and territories and 103 foreign countries, according to Emory’s Office of the Registrar. The oldest degree candidate is 72-year-old Helen Donnelly, who will receive a bachelor of medical science degree in medical imaging. The youngest candidate is 19-year-old Aditya Maheshwari, who is set to receive a bachelor’s degree in math and computer science. Some 59 percent of this year’s graduates are women; 41 percent are men. This year’s keynote reflected a story of remarkable commercial success. Dubin, an Emory alumnus, is widely recognized as a creative entrepreneur, executive and brand-builder. Under his creativity and leadership, Dollar Shave Club revolutionized the razor industry, growing to become the second-largest men’s razor seller in the U.S. In 2016, the company was acquired by Unilever for $1 billion — one of the largest deals in e-commerce history. He has been recognized by Ernst & Young as the 2016 Entrepreneur of the Year, in Fortune’s 40 Under 40, and in Business Insider’s 30 Most Creative People in Advertising. Dubin, who received a BA degree in history from Emory, was the keynote speaker at the first Emory Entrepreneurship Summit, organized and hosted by Goizueta Business School in April 2015. He was an inaugural recipient of the Emory Alumni Association 40-Under-40 Alumni Recognition Program in 2017. He began his career as an NBC page, followed by an editorial position at MSNBC. He then transitioned to digital marketing, developing custom content for brand advertisers including Gatorade and video game company EA, and on behalf of properties such as Time Inc. and SI.com. Just before founding Dollar Shave Club, he worked in the video seeding space, creating and driving engagement to branded content made by companies including LG, Ford, Capital One and Taco Bell. During Monday’s ceremony, Dubin received an honorary Doctor of Letters degree — among a series of special awards and recognitions that will be presented to students and faculty. Bill Bolling, founder of the Atlanta Food Bank. Bolling led the organization’s distribution of more than half a billion pounds of food and grocery products through a network of more than 600 local and regional partner nonprofit organizations that feed the hungry across 29 Georgia counties. As a charter member of Feeding America, the national network of food banks, Bolling was instrumental in the start-up of food banks across the country. Carmen de Lavallade, artist of dance, theater, film and television. Her dance career includes having ballets created for her by Lester Horton, Geoffrey Holder, Alvin Ailey, Glen Tetley, John Butler and Agnes de Mille. De Lavallade was the principal dancer with the Metropolitan Opera and a guest artist with the American Ballet Theater. She has choreographed for the Dance Theatre of Harlem, Philadanco, the Alvin Ailey American Dance Theater and the Metropolitan Opera. Gay J. McDougall, human rights lawyer who confronted apartheid in South Africa. McDougall was one of five international members of the South African governmental body established through the multi-party negotiations to set policy and administer the country’s first democratic, non-racial elections in 1994, resulting in the election of President Nelson Mandela and the transition from apartheid. McDougall served as the first United Nations Independent Expert on Minority Issues from 2005 through 2011.